I absolutely love Christmas! It is my very favorite holiday and I love everything about it. I love the decorations, baking, gift buying and giving and all the parties. One of my favorite things to do is find just the right items to go into everyone’s stocking. I know it is silly, but I get a bigger kick from shopping for my stocking stuffers than I do for the bigger gifts! Here is a list I compiled for the ladies, including products from Voila Natural, a great company I have recently found! When Caitlin reached the age of 15, she began to see a difference in her skin. She has been getting a bit oily in the “T” zone and gets stress pimples along her hairline. She also gets breakouts on her chin which are caused by the chin rest of her violin. I knew the best beauty products for her would be those made with ingredients from the earth. Not only do the Voila Natural products make great stocking stuffers for women, but for teens as well! Their products are made from all natural ingredients that are from the earth, so I feel really good about recommending them to my friends and family. The Clay and Mud Mask, which is currently available on Amazon for $14.00, has powerful ingredients to clean, exfoliate, nourish and firm your skin. With the Kaolin clay and Dead Sea mud, they gently draw out toxins that can make your skin breakout or have excess oils. It has essential minerals like calcium and magnesium as well as skin softening Shea Butter, Organic Sunflower Oil & Organic Jojoba Oil. Their Pure Organic Argan Oil, which sells for $19.95 on Amazon, is amazing for your hair or skin. It not only nourishes your hair and skin, giving it a healthy sine and glow, but it promotes hair growth as well. Caitlin has really long and thick hair but it is on the dull side. With just a small amount rubbed in your palms and then onto your hair makes it gorgeous! Do not tell her I had to try a little out on myself for the review before putting it in her stocking! Be sure to stay current with the latest from Voila Natural and follow them on Facebook and Twitter. I’m sure the clay and mud masks are great. I would like the clay and mud mask. I would love to try their Clay & Mud Masks! I’d love the Organic Argan Oil. First I’d like to try the Argan Oil. I would like to try the Clay & Mud Mask- sounds wonderful! The clay and mud mask. The Argan Oil, for sure. I’ve heard it works wonders for eczema, and mine has flared terribly this winter. I would like the Pure Organic Argan Oil to try on my hair. It is lifeless and this may help it. thank you. The clay and mud mask!! I would love the Clay Mud Mask. I would like to use the argan oil – so many uses and very natural. 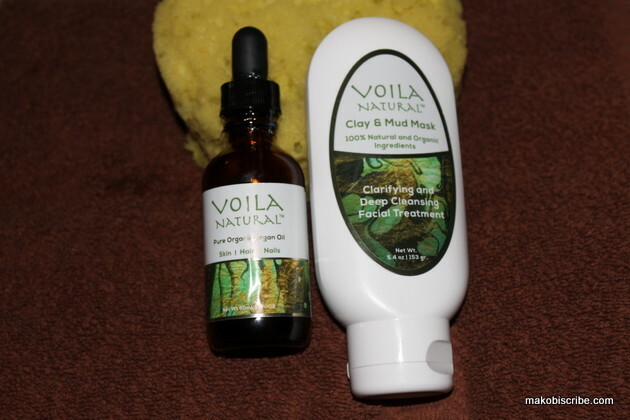 I’d like to try Voila Natural Clay and Mud Mask which has ingredients from the Dead Sea and benefits with detox, exfoliation, moisturizes and refreshes all in 5 minutes. I would love to try their mud mask! I would like to try the Clay & Mud Mask. I like the clay and mud mask! I would love the organic argon oil, I’ve heard such great things about it. I’d like the pure organic Argan Oil. I would really like to try the clay and mud mask, it looks amazing. I would love to see the difference it would make using a natural mask! I love trying out new facial treatments. The Clay & Mud Mask sounds fantastic. The Clay and Mud Mask! I pick the 100% pure Argon Oil. My hair could really use it from excessive flat ironing! I’ve been wanting to try Argan Oil for a long time. I really love the Organic Argan Oil, and would love to have this. I love the clay mud mask. I would love the clay mask! Would love to try that Argan Oil. I would like to try the clay mud mask. I love argan oil. works great for my unruly hair. I would really like to try the Clay & Mud Mask. The clay & mud mask definately seems like a product that I would love to try! I would love to try the organic Argan oil. I would like the 100% pure organic argan oil. I’d love the mud mask! I’ve always wanted to try Argan oil but it’s pricey so I’d try their Organic Argan Oil for my dry skin.